When Viri Hernandez was growing up in Maryvale, a mostly Latino neighborhood in west Phoenix, her family lived in the shadows. Like her parents, she was undocumented, having been taken across the border from Mexico when she was a baby. The family lived in fear of Immigration and Customs Enforcement, or ICE, as well as the Maricopa County Sheriff, Joe Arpaio, who would often conduct raids and set up checkpoints in her neighborhood in an effort to arrest anyone he suspected of being an undocumented immigrant. “We were constantly hiding,” she remembers. One day in 2014, Arpaio’s deputies raided the construction company where Hernandez’s father worked. He happened to be away that day, but the agents took her father’s file, which included his home address. Aware of the implications, less than a week later, Hernandez’s parents hurriedly packed their things and moved to another city in Arizona, outside Arpaio’s district, while Hernandez remained in Phoenix for university. Although she was protected from deportation under former President Barack Obama’s executive order known as Deferred Action for Childhood Arrivals, or DACA, her parents were still vulnerable to deportation. That day, the fear of losing them became real. The experience gave Hernandez, an academic star and an aspiring teacher, a new goal: to ensure Joe Arpaio did not win his bid for a seventh term as sheriff in the 2016 elections. Her efforts paid off last November when the sheriff was voted out of office, and again earlier this summer, when a court convicted Arpaio of criminal contempt for ignoring a federal judge’s order to stop violating the civil rights of Latinos. For Arizona’s immigrant rights activists — and for Hernandez in particular — the conviction sent an important message: Arpaio was “not above the law.” But last week, when news spread about President Donald Trump’s pardon of the former sheriff, the turn of events served as a reminder that although one chapter in the activists’ fight had ended, another was just beginning. Arpaio’s “law and order” image proved popular with voters at a time when public concern about crime rates and drug use was rising. Later, it would find an easy scapegoat in the growing numbers of undocumented immigrants settling in Arizona from Mexico and Central America — from fewer than 100,000 in 1990 to nearly 500,000 by 2006, when Arpaio began his raids. After Andrew Thomas was elected as chief prosecutor of Maricopa County in 2005 on a promise to crackdown on illegal immigration, Arpaio sensed a new opportunity to raise his profile. The sheriff’s deputies began what he called “saturation patrols” which set up roadblocks in mostly Latino neighborhoods to stop motorists and ask for their citizenship papers. Boosted by new Department of Homeland Security regulations that empowered local law enforcement agencies to aid in the federal immigration effort, Latino drivers were routinely arrested for little or no apparent traffic violations. If they happened to be undocumented, Arpaio would turn them over to ICE for deportation, in a bold break from state law enforcement norms. A two-year Justice Department investigation found that Latinos in the northeastern part of Maricopa County were nine times more likely to be pulled over for the same infractions as other drivers. In the process, Arpaio frequently arrested and detained U.S. citizens and legal residents, including children, for hours at a time and without a charge or a warrant. When Hernandez graduated from Maryvale High School in 2009, she was in the top two percent of her class, receiving awards for her academic achievements and community service. She was offered a full college scholarship but had to turn it down because she was undocumented. Instead, Hernandez’s parents scraped together the tuition for a private college in West Phoenix. Meanwhile, Arpaio’s policies were gaining traction among Arizona’s Republican politicians. In 2010, state lawmakers passed S.B. 1070, codifying Arpaio’s saturation patrols and requiring state police to check the immigration status of anyone they detained. The bill also prohibited undocumented immigrants from working, and it criminalized their failure to carry immigration documents. For Hernandez, the new law felt like a personal attack. She was excelling in school and had no criminal record; she was doing everything right, and still, none of it seemed to matter — there were people who did not want her in the country. 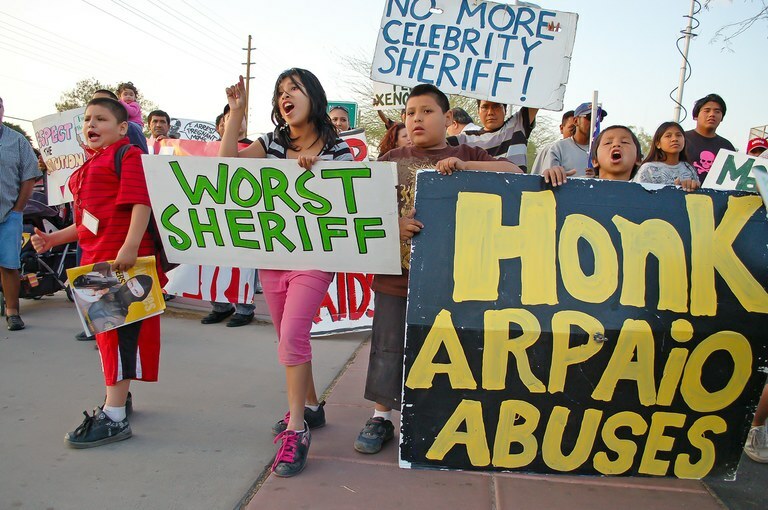 Children from the town of Guadalupe in Maricopa County, Arizona, join the march outside a 2009 town hall meeting where Maricopa County Sheriff Joe Arpaio was meeting with residents to discuss the sheriff department’s saturation patrols. Cornejo felt particularly protective of young undocumented immigrants brought to the U.S. by their parents as children. For her, the plight of Dreamers, as they are known, crystallized the injustices of the U.S. immigration system. Even before S.B. 1070 became law, Cornejo was helping teachers protect undocumented students, sharing information about Arpaio’s patrols with teachers and distributing know-your-rights pamphlets. Later, she used social media to attract press coverage and find legal aid for Dreamers taken into custody by ICE. In those years, activists like Hernandez and Cornejo trained people in their communities, organizing a “rapid response team” that could mobilize immediately when a raid or saturation patrol occurred, showing up to document the incidents with video — evidence that became a crucial part of the legal cases that would lead to Arpaio’s conviction. In 2007, the American Civil Liberties Union and others sued Arpaio for racial profiling, the first of many lawsuits against the sheriff worth nearly $70 million in legal costs — and paid for by Arizona taxpayers. Though federal judges twice ordered him to stop his practice of detaining people without due cause, Arpaio openly defied them. In the sheriff’s eyes, he was merely doing what the government neglected to do: upholding the nation’s immigration laws. Still, voters in populous Maricopa County re-elected the sheriff six times. The county is 56 percent white; many of his supporters were retirees who saw Arpaio as the last stand between their white suburban stronghold and the increasingly diverse population around them. “You can get a lot of votes by being tough on illegal immigration and Arpaio came to the conclusion that this was good politics,” says David Berman, a political science professor at Arizona State University who has studied the influence of Arpaio’s rhetoric among voters. But Arpaio’s tactics eventually backfired. As the 2016 election approached, activists like Cornejo and Hernandez turned their energy into mobilizing first-time Latino voters. Hernández started a campaign called BaZta Arpaio (a play on the Spanish word basta, or enough, and Arizona’s abbreviation) designed to vote the sheriff out of office. Unlike traditional campaigning strategies, BaZta was tailored to Latinos, a demographic group that had historically felt disenfranchised by the political process. So its strategy included parties and events where activists showed videos, and shared their own stories in an effort to celebrate Latino culture and traditions. Community members began making piñatas resembling the sheriff and by last October, Hernandez brought 500 people with her for a door-to-door canvassing event in Phoenix, organized by BaZta. They came from across Phoenix and Arizona; from California and New Mexico; they were Latinos and non-Latinos alike, legal immigrants and those who were undocumented. Even Hernandez’s parents, traumatized by Arpaio, showed up. A month later, Arpaio lost his bid for re-election by nearly 13 percent, thanks in part to a record turnout of Latino voters in Maricopa County. Yet their victory against Arpaio would be overshadowed by a much larger threat: his endorsement of Trump’s candidacy and, in November 2016, Trump’s win, followed by his pardon of the former sheriff’s crimes. The most worrisome aspect of the pardon, said Cornejo, is the implication that those who have been found guilty of human rights abuses will be pardoned if Trump considers them allies. “That should scare everyone,” she added.